I get asked all the time about how to clean and lubricate the Curta. 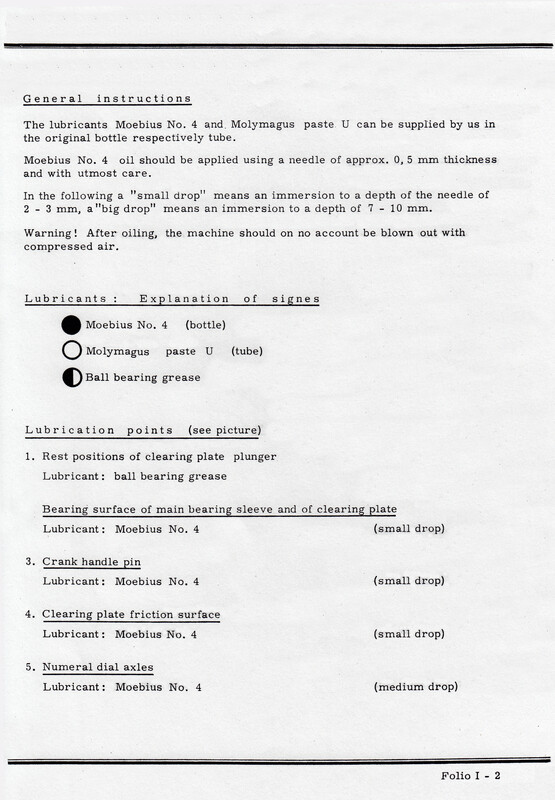 Here are some helpful email snipets from Nicholas Bodley and Jack Christensen plus some scans from the Curta Service Manuals. "For lubricants, sewing-machine oil from a reliable source might not be too bad. Better would be a good grade of clock oil, for traditional weight- or spring-driven clocks. You could find out where to get it from a friendly clock/watch-repair shopkeeper. The actual source would be a wholesaler who sells clock-repair supplies and parts. Another source would be a camera-repair shop." 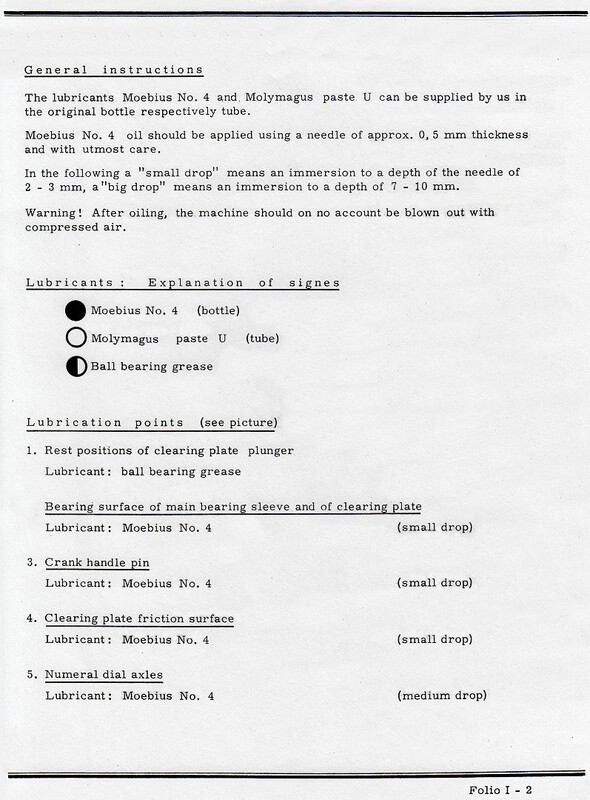 "Curta operation problems can almost always be corrected. Often it is just a matter of disassembly, cleaning and re-assembly. The problem is rarely, if ever, solvable by lubricating the offending parts. WARNING: Do not indiscriminately lubricate the Curta with WD-40 or any other cleaner/lubricant. 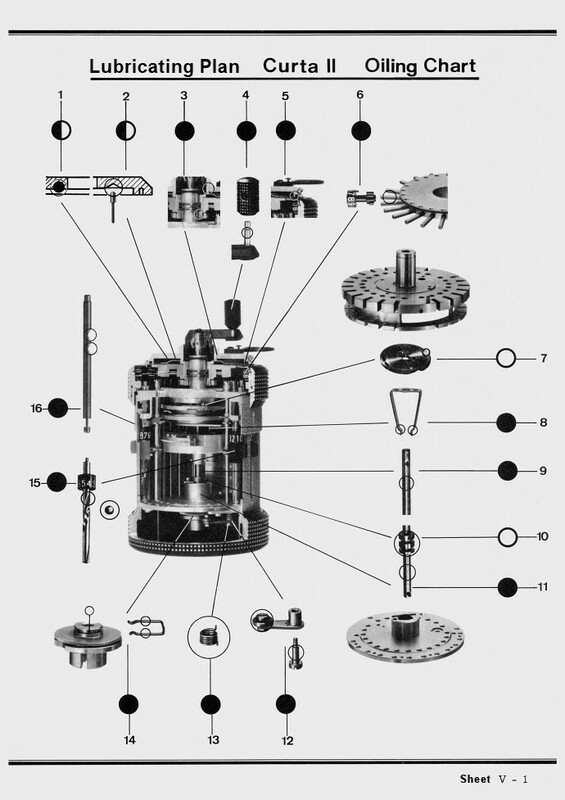 There are about 50 places inside the Curta that need a special non-evaporating, non-acidic, non-migrating, light watch oil. And there are over 150 places that must not have any oil at all. It is these 150 places that likely initiated the problems you are experiencing. And there are three places in a Type I that use a bearing grease or paste. Such heavy lubricants will be washed away by WD-40 or a general cleaner." 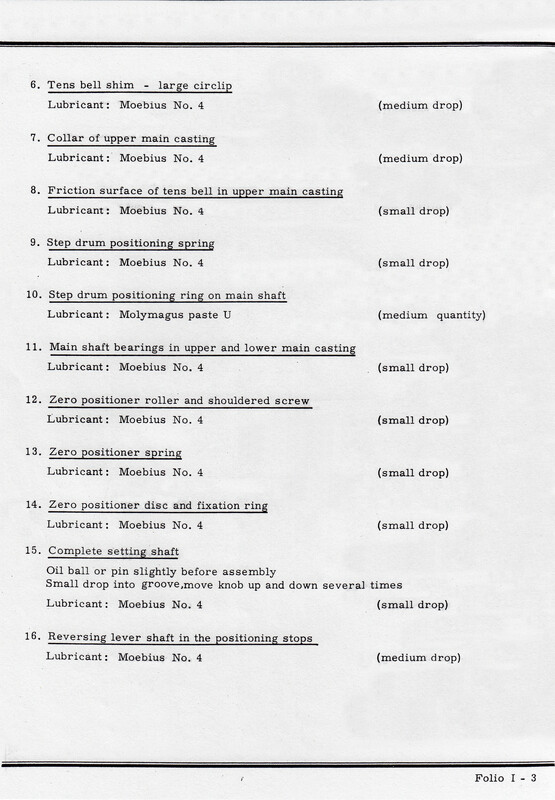 Use ladies watch oil for the bottom section of the Curta (pawl spring and shoulder screw, zero-positioning spring and shoulder screw, zero-positioning/anti-reversing disc locking pin and retaining clip. Apply a VERY VERY small amount of oil to the center of the steel zero-positioning wheel. But do not apply any oil to the zero-positioning roller surface or pawl notches. 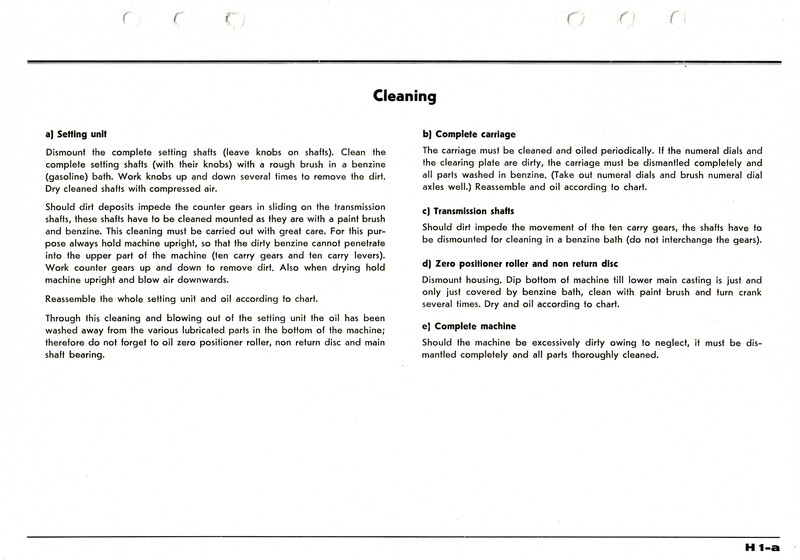 For the indexing cam, apply a small amount of "Molybdenum Disulfide Paste" grease. Apply a small amount of watch oil to the setting sliders spiral grooves and reversing slider parts, and to the transmission shaft gears that are moved by each of the sliders. 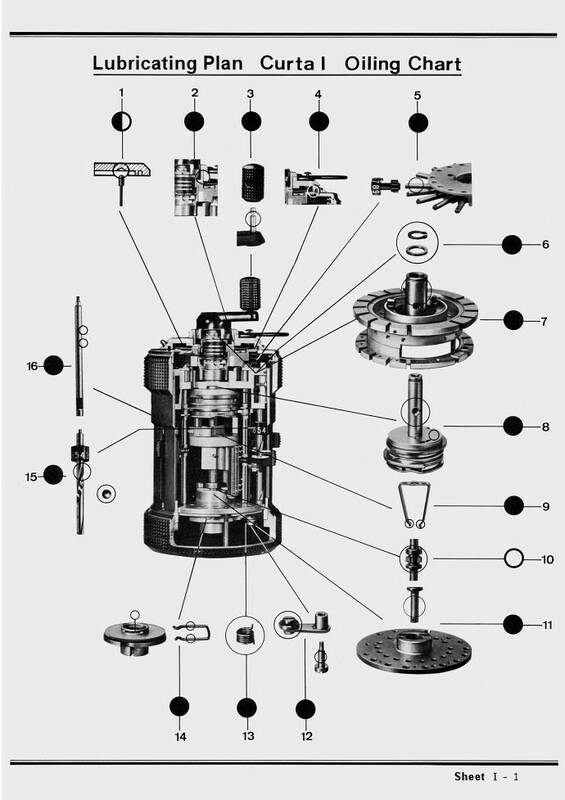 Do not apply any oil to the tens carry subassemblies or the tens carry transfer gears. Apply a drop of watch oil to the step drum positioning spring fingers and to the step drum roller pin that slides up and down in the tens bell/tens unit grove. Apply a small amount of watch oil to the axles for the results and counter digits. 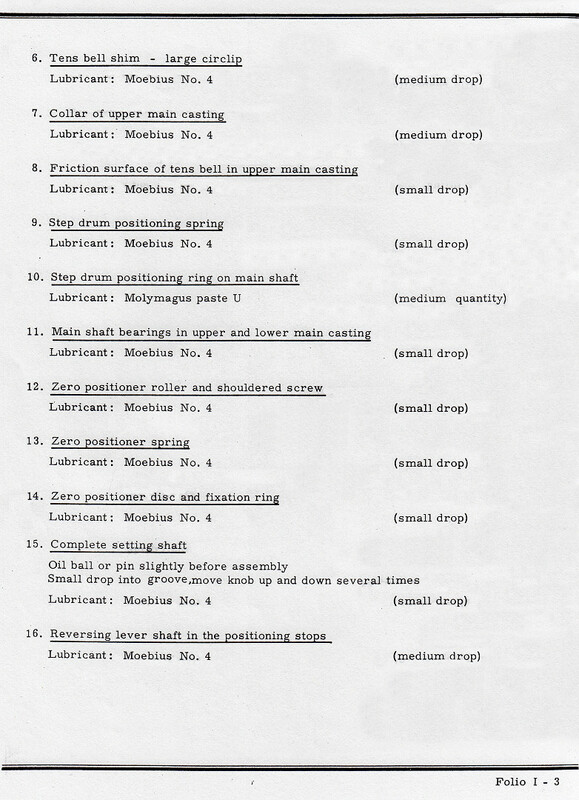 Do not apply any oil to the crown gears, the carriage spider spring, or the carriage digit indexing balls. Apply a drop of oil to the carriage plate plunger and its coil spring. I use a drop of Krytox (a Dupont fluorinated grease product) in each of the two clearing plate plunger notches around the underside of the clearing plate. "Molybdenum Disulfide Paste" grease can also be used. Apply a very small amount of oil to the clearing lever plunger (this is on machines with a metal clearing lever). On a Type II, apply a small drop of Molybdenum grease to the carriage locking pin's lower grove, and a small drop of watch oil in the upper grove. On a Type I, put two drops of oil in the locking ball hole in the center bearing column. I always apply a drop on either end of the carriage coil spring, to the top part of the main shaft (and the top of the tens bell for the Type I), and around the carriage's brass bushing. I also oil the taper pin for the crank and the knurled knob shaft.